Opening a book for the very first time still fills me with the same excitement and anticipation that it did as a child. Not only do books enable children to discover new worlds, meet new people and learn about the past, but they also have the power to transform lives. By sparking imaginations, stimulating critical thinking and helping develop empathy, reading gives children the very literacy skills they need to succeed at school, at work and in life. 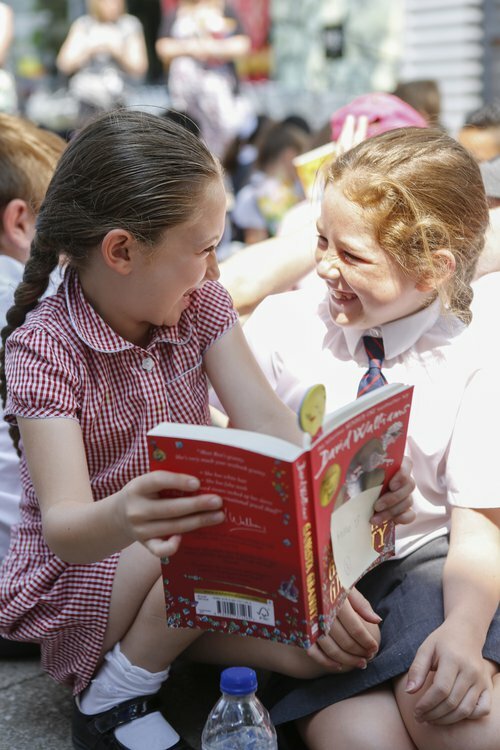 Helping children discover a love of reading is crucial, but new research published today by the Read On. Get On. coalition shows that children’s enjoyment of reading is lagging worryingly behind their reading skills. Why does this matter? While it is undeniable that reading skills are essential, the importance of reading for pleasure should not be underestimated. Study after study has shown how reading for pleasure is vital for academic success, mental health and even later economic success — the emphasis here is on reading for pleasure: being able to read does not give the same benefits as enjoying it. Getting the right book into the right child’s hands at the right time is the key. Yet 1 in 8 disadvantaged children in the UK don’t own a single book and primary school libraries have closed across the nation. If your parents can’t afford to buy books and your primary school hasn’t got a library, how on earth are you supposed to become a reader for pleasure? We’re facing a social mobility time bomb. The Read On. Get On. coalition also found that the problem is bigger for boys than it is for girls. Many parents tell me that my books have been instrumental in turning their boys into readers, and I have to say that although it is always a pleasure to be told your books have been effective, it has never been my intention to target boys specifically. I don’t want to write either a boys’ book or a girls’ book, and I am wary of making generalisations about boy or girl behaviour because that can so very easily become a self-fulfilling prophecy. I haven’t found the gender of the protagonists in my books to be an issue: I’ve lost count of the number of nine-year-old boys who say that Camicazi, the indomitable girl hero in How to Train Your Dragon, is their favourite character, and that is why I am so keen on boys and girls reading the same books. Girls need to see girls like themselves being strong, dynamic heroes, and boys do too. I do not have a boy reader in mind when I write my books, but I do have a reluctant reader in mind. How do you get children — both boys and girls — to read for pleasure in an age where telly and film are beamed magically into children’s heads without them having to do anything? Children are beginning to associate books and the whole de-coding process of learning to read with something that is difficult or a struggle, particularly if they have dyslexia or another learning difficulty. I work very hard to try and overturn that impression. I make the storylines of my books pacey and thrilling, and I break up the text with as many wild and whirling illustrations as I can, to invite the child in and to reward them for sticking with the story. I make the cover shiny and jewel-like so that, in the mind of the child, books are sweets, not brussels sprouts. For I, myself, have been a parent trying to get a tired, fractious child to read. Even as a children’s author, I found it a struggle to find books that would turn one of my kids into a reader for pleasure. In my own case, it wasn’t my son who didn’t get into reading, it was my daughter who wouldn’t sit still. It took a lot of persistence and I sympathise hugely with parents and teachers trying to get children reading for the joy of it when they’re fighting against ever-more pressurised school exams and targets. My advice? If the books your kids bring home from school don’t interest them, try others from the library, and don’t force your son or daughter to finish a book they don’t like. Follow your kids’ interests — there really is a book for everyone. Keep reading with your kids way beyond the age they can read for themselves. Try to read together for 10 minutes a day; it can be really hard to carve out time in our busy lives, so rest assured that it doesn’t need to be all at once — a couple of minutes here and there is better than not at all. I write my How to Train Your Dragon and The Wizards of Once books to be read aloud, because books read to you in your parents’ voice live with you throughout your life and send an important message: books are important; books are powerful, magical things that can make your dad cry or your mum laugh, and have the sort of wisdom in them that can change your life. If we want our country, our children, to thrive in the future, we would do well to heed these statistics, and put the joy of reading back into the heart of education and home life. The quest to get every child reading for pleasure is not just an optional extra — it’s an imperative. This article was originally published in The Independent.